All participants and lecturers will stay in the Laguna Nivaria**** hotel. The stay includes breakfast. The lunch will be served in the cafeteria of the Instituto de Astrofísica de Canarias. Participants will be accommodated on the basis of shared rooms. Hotel bookings are handled directly by the organization. Those participants wanting to share room with a specific person or with specific requests should indicate it by email to winter@iac.es. 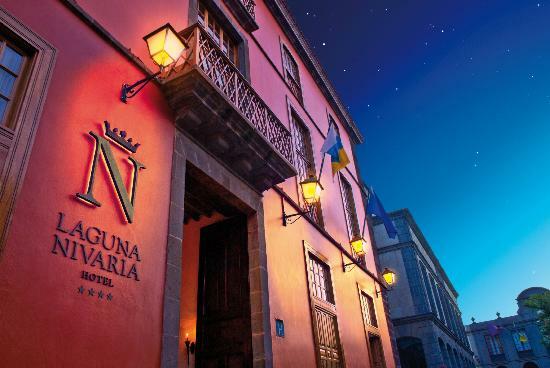 This 4 star hotel is a 16-th century mansion located in the old town of San Cristóbal de La Laguna, a UNESCO World Heritage Site. See a map of the area showing the hotel location. • Bus line 111 (5,40 €) from TFS to Santa Cruz de Tenerife (main bus terminal). Until 22:30 h, departure frequency is 30 min, starting at 6:00 h. Bus desk (labelled TITSA) is located at the extreme north side of the terminal and the bust stop is just outside of the terminal in front of the Bus desk. The journey to Sta. Cruz bus station is about 40 min. From there, the most convenient option to reach La Laguna is to take the tram (“tranvía”) as it is really comfortable and the end of the line is very close to Hotel La Laguna Nivaria (3 min. walk). As you go out of the Bus terminal station in Sta. Cruz (East exit facing to the sea) you will see the tram station (it is the terminal station). Your destination is “La Trinidad”, the other end of Line 1. Alternatively, a taxi from the Bus terminal station in Sta. Cruz to Hotel Nivaria will cost you about 14 €. • We recommend you to take a taxi as it will just cost you about 7 €. Alternatively, bus line numer 102, 107 and 108 will take you to near the Bus terminal station in La Laguna. From there, a 15 min. walk to Hotel Nivaria. The most recomendable way to obtain money is by withdrawal from any of the numerous cash-dispensing machines. If you are travelling through Madrid or Barcelona, the exchange bureau opens there round the clock. However, NO currency exchange facilities are available in TFN Airport, just cash-dispensing. There are two airports on the island of Tenerife, one on the north side (Tenerife Norte, TFN, also known as "Aeropuerto de Los Rodeos") and the other one on the south of the island (Tenerife Sur, TFS, also known as "Aeropuerto Reina Sofi­a"). Both airports are at about 2.5 hours flying time from Madrid, and about 3 hours from Barcelona. To search for either airports use the code TCI. Most international flights and some domestic flights go to the TFS airport, while most domestic flights go to the TFN airport. Most people travelling on scheduled flights will have to fly via Madrid or Barcelona and then onto the northern airport. Please book your flights early!. Scheduled flights as well as charter flights from some european countries can be heavily booked at certain times of the year. Puerto de la Cruz is about 26 Km from TFN, and 95 Km from TFS, with a motorway link covering the full journey in both cases. The easiest access is from the northern airport (TFN) along the TF-5 motorway. Puerto de la Cruz is approximately 20 mins away. The TFS airport is more than an hour along the TF-1 and TF-5 motorways. There is a direct bus service to Puerto de la Cruz (line number 343). An alternative to reach Puerto de la Cruz from TFS is to stake bus service 111 to Santa Cruz (the capital of the island) and stop over to service 103. Once in Puerto de la Cruz central station, it is best to take a taxi (5 min) to the hotel. Bus line 111 (6,20 €) from TFS to Santa Cruz de Tenerife (main bus terminal) and from there bus line 103 (4,40 €) to Puerto de la Cruz main bus terminal. Then taxi to the hotel (~5 €). Bus line 102 from TFN to Puerto de la Cruz (3,15 €). Then taxi to the hotel (~5 €). Please check the bus timetables in the local bus company website (TITSA) before travelling to avoid unexpected last minute changes in the scheduling of the services. Buses are painted bright green, and the local name for bus is "guagua" or "autobus". Note: The bus terminal in Puerto de la Cruz is relatively far from the hotel, so we recommend to take a taxi fo reach the hotel (about 5 €). The most recomendable way to obtain money is by withdrawal from any of the numerous cash-dispensing machines.